What do you get when you put three athletic boys together? Championship teams and lifelong friendships. Brad Rootes, Mike Kemp, and Dusty Bianchin quickly became friends during their early years of elementary school. A common interest in sports lead them to play together on various hardball, softball, football, volleyball and basketball teams. The boys were very successful at every sport they played, often playing for teams at the highest skill level. 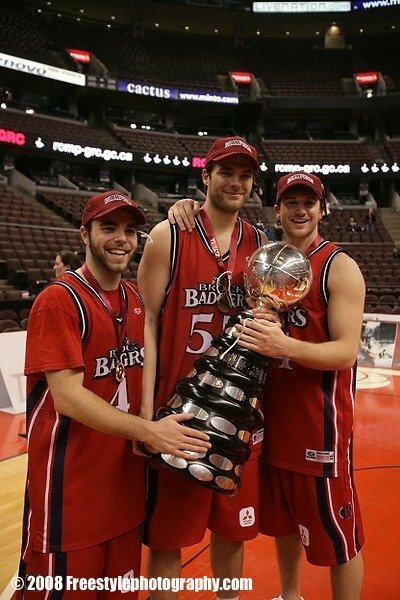 Together they excelled at basketball and went on to win numerous championships in elementary school, high school, Club ball, and University, concluding with a National Championship while playing for Brock University. This CIS Championship provides a storybook ending to three tremendous careers in sports. But more importantly, sports have allowed these three men the opportunities to create great memories together and to develop a friendship that is sure to carry on for the rest of their lives. Inducted at ceremony held on January 17, 2010.